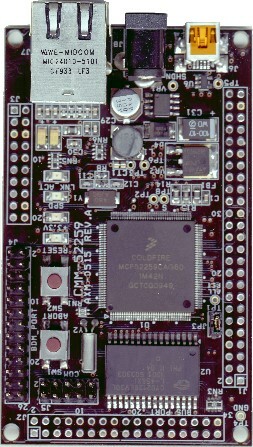 The CMM-52259-OEM is a module featuring the MCF52259 microcontroller. This small form factor (2.2”X3.5”) board is ideal for OEM embedded applications where low cost and small size are important. Shipped with MQX RTOS installed. The Freescale MQX RTOS provides real-time performance within a small, configurable footprint. It is designed to have a modern, component-based microkernel architecture allowing for customization by feature, size, and speed by selecting the components engineers wish to include while meeting the tight memory constraints of embedded systems.